Iraq has struggled with the concept of federalism ever since it was enshrined in the 2005 Constitution. It is beyond the scope of this paper to discuss how the authors of the Constitution envisioned a federal Iraq, or to put it more accurately, how competing visions led to the adoption of incoherent and often conflicting provisions within the Constitution over how power and authority should be distributed between the center and periphery. Suffice to say that there were two key motivating factors, namely, Kurdish demands to maintain the semiautonomous arrangement of the Kurdistan Region that had existed since 1991; and the consensus among political elites that decentralising power from Baghdad would safeguard from the emergence of another autocratic regime in the future. While the debate over federalism in Iraq has evolved considerably over the past decade, its most recent iteration emerged after the fall of Mosul in June 2014, when ISIS took control of a third of Iraq’s territory and the viability of the state came under question. Here, federalism offered a roadmap for how the country could salvage its territorial integrity, defeat ISIS, and bring about a sustainable political arrangement that could protect against future conflict. The Obama administration was among the first to enunciate this approach in July 2014. Testifying at the Senate Foreign Relations Committee, former deputy assistant secretary of state, Brett McGurk, outlined a strategy to contain and combat the onslaught of ISIS, based on what he described as the principle of ‘functioning federalism’. According to McGurk, this concept was ‘defined in the Iraqi constitution – but never fully and effectively implemented.’ Functioning federalism was anchored on a set of five core principles that – in essence – would devolve local security responsibilities to sub-national authorities including through the establishment of a national guard composed of locally armed units that would secure their respective provinces. The role of federal forces would be restricted to protecting the country’s borders and carrying out other federal functions. The rationale behind this approach was underpinned by two prevailing narratives at the time: first, that the fall of Mosul was precipitated by the lack of trust that existed between the Iraqi army and the local population; and secondly, that the U.S.-backed Awakening Movement in Anbar province had proven to be a successful counterinsurgency model could be replicated across the three Sunni-majority provinces to spearhead the fight against ISIS. In this regard, functioning federalism was primarily framed as the devolution of security powers that would address the grievances of local populations and restore trust in the government. But the national guard bill languished in parliament because of disagreements that emerged between political blocs over chain of command, namely whether national guard forces would answer to provincial governors or the prime minister. Meanwhile, developments on the battlefield shifted the focus of the debate over federalism. 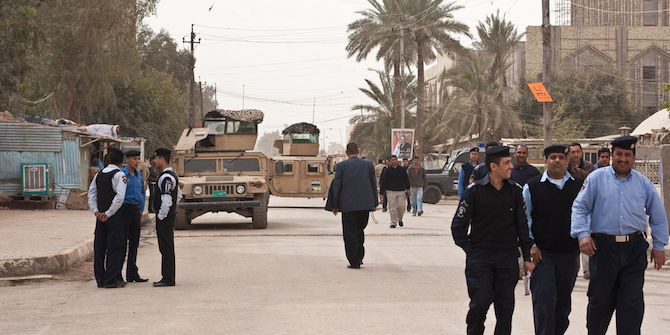 While thousands of local Sunnis were recruited, trained and incorporated into the Iraqi Security Forces and Popular Mobilisation Units, the operations to reclaim key urban centres including Tikrit, Fallujah and Mosul were all spearheaded by federal forces including the Counterterrorism Service, Iraqi army and federal police. The narrative that ISIS could only be defeated by local forces was undermined to the extent that recent polling in liberated provinces has shown an overwhelming preference for security to be managed by the Iraqi army. Thus, the imperative of functioning federalism shifted from winning the war to winning the peace. Proponents of decentralisation now advocate for administrative and fiscal measures, focusing on the need to enhance service provisions including water, electricity, healthcare and education. The rationale states that sub-national actors are more closely attuned to the needs of their constituents and have their best interests at heart. This approach is problematic for two reasons: firstly, there is little evidence to suggest that local governments have sufficient capacity to absorb new powers. For example, their existing paper-based financial management systems are incapable of incorporating complex and expanded budgets; and sub-national bureaucrats have little experience in the degree of strategic planning required to devise investment plans or undertake the requisite oversight needed to ensure efficient delivery of services. Given the urgency of stabilising liberated areas, it is likely that federal entities will retain much weight over the medium term. Secondly, local assemblies are no more cohesive than the national bodies in Baghdad that are plagued by political infighting and mismanagement. In 2017, the governors of all three liberated provinces were impeached by their respective provincial councils. In Anbar, Governor Suhaib al-Rawi was dismissed over allegations of financial and administrative corruption. Al-Rawi, who belongs to the Iraqi Islamic Party, was replaced by Mohammed al-Halbusi, a member of the rival al-Hal bloc. Meanwhile, governor of Salahadin province, Ahmed al-Jubouri, was sentenced to 3 years in prison over allegations of corruption but was later acquitted by an administrative court. Most recently, Mosul’s provincial council voted to sack Governor Nowfal al-Akoub after graft accusations were also brought against him. In the oil-rich southern province of Basra, Governor Majid Nasrawi reportedly fled the country after a court issued a warrant for his arrest. Some believe that devolving greater political and financial resources to sub-national actors at this time will only exacerbate the existing competition over power and authority at the expense of local communities that are in need of urgent assistance. Nevertheless, existing legislation does provide great scope for implementing decentralisation. While Article 116 of the Constitution institutes federalism, it is Law 21 of 2008 that first codified the relationship between the central government and the provinces. Despite undergoing amendments in 2010 and 2013, the ‘Law of Governorates Not Incorporated into a Region’, has only been partially implemented, in part because there had been little political will in the past to undertake the necessary reforms. But Iraq is now at a crossroads. The military defeat of ISIS has focused minds on the huge burden of rebuilding the devastated towns and cities, and providing essential services and employment to the millions of displaced people that are returning home. Here, it is critically important to frame decentralisation within this post-conflict context. Understanding how to incentivise stakeholders to move beyond dysfunctional federalism is a good starting point. It should be noted that the decentralisation agenda is not a prominent electoral issue. In a 2017 NDI survey, only 14 percent of respondents felt that decentralisation was a very effective means to achieve reconciliation. In contrast, 42 percent strongly believed in ending sectarian quotas for government jobs. Similarly, a recent Bayan Center poll showed that less than 3 percent of respondents nationwide felt that resolving issues between the centre and periphery should be a key priority for candidates running in this year’s elections. Considering both the political economy of decentralisation, and Iraq’s existing macroeconomic predicament is important to understand the trajectory and pace of the reform process. Two examples illustrate the obstacles ahead. Amended Law 21 legislates for petrodollar payments to the oil producing provinces. It allocates 5 percent of revenues from hydrocarbon sales to these provinces, but given the current fiscal shortfall, few of these payments have been made. This has generated a public backlash in the southern oil-rich provinces where infrastructure and services have been historically neglected by successive administrations. Local governments are blaming their budgetary shortfalls on the federal government for failing to meet its obligations on petrodollar payments, which makes it difficult to pursue other reform measures. A prime example is on electricity reform. Baghdad is introducing an ambitious project to roll out 24-hour supply of electricity from the national grid and privatising the collection of electricity tariffs. This would potentially generate substantial revenue and cut out considerable waste from private generators. But Baghdad has been confronted with widespread popular opposition in the southern provinces. Local governments have even suggested that electricity bills should be paid for out of the debt owed to them from outstanding petrodollar payments. Despite the hurdles, modest progress has been made to implement aspects of Law 21 over the past 12 months, including the devolution of sub-directorates and departments of seven federal ministries. But where staff and facilities have been transferred, budgets are often still not in place. To what extent decentralisation is simply deconcentration – meaning the transfer of power to an administrative unit of the central government at the local level – rather than actual devolution of power to sub-national entities, is up for debate. But policymakers should not lose sight of the end goal. If Iraq is to emerge from decades of conflict and create the conditions for a sustainable peace, it needs to first rebuild trust between citizens and state by demonstrating efficient and effective governance. The extent to which federalism is functioning in Iraq should be measured against this standard.